We’ve been delivering quality chiropractic care since 2001, now specializing in sports injuries and the Webster Technique for pregnant women. 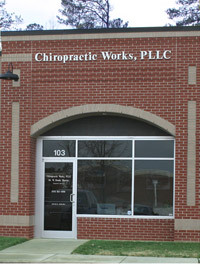 I opened Chiropractic Works in October 2001. I’m from the Wake County area and saw the potential of an under-served area that was experiencing tremendous growth. We are less than 2 tenths of a mile from the WakeMed Hospital Northern Campus and ED. We are in the Falls River Professional Center which boasts many additional healthcare specialties (Dermatology, Psychology, Gynecology, Dentistry, Pediatrics, and an Urgent Care). I have formed great relationships with our neighbors and have many of the specialties as healthcare partners. I’m also involved in the community–especially in sports–and I love that being a Sports Chiropractor combines both of those loves. When opening Chiropractic Works in Raleigh, I wanted a personable practice where everyone felt they got the time, and the care, they needed. The waiting area is open and inviting, but our magazines rarely get touched! We know that your time is valuable and we strive to get you in and out with the care you need and a smile. We’re the office where you can get individualized service and explanations. We often have patients bring their MRI and X-rays reports to us for clarification because the other practitioners may have gone through the findings too quickly. Experience, Expertise, and Integrity. I’ll explain what is wrong, develop a plan to help, and discuss any other healthcare options available, all in a no nonsense, straightforward and common sense way. We put the patients healthcare first and foremost in our decisions and recommendations. When you choose us for your care, you’re choosing a team that will be with you every step of the way to help you reach your goals, naturally and without the need for prescription drugs or surgery. Patients who want a partnership in health do the best. If you looking for the one stop miracle cure in the bottle, then we know other places that may fit you better, but you’ll still be wondering why your problem comes back down the road. But if you’re serious about finding the root cause of your problems and how you got there, and want to do the work to improve and prevent future occurrences then we are the practice for you. Contact Chiropractic Works now to schedule an appointment and begin your journey with wellness today.